The goldblotch grouper along with mottled grouper, have the most streamlined body shape from all groupers. Strong powerful tail indicates the fast nature of this so called “rock fish” that myth wants it to spend the days locked up in a hole. 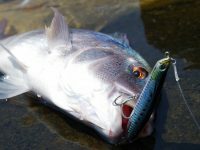 Although most fishing techniques aim in specific fish species, shore jigging can capture a wide variety of fish, with the same jig but different moves and strategy. 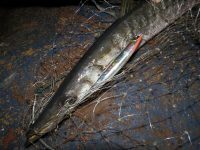 Although the main targets of this technique are pelagic predators, there are some fish with a more stable character, choosing places to settle for long periods. They live in holes and ambush at passing prey. As they grow they change residence hole. Their body has significant differences from the other fish. Scales small and rugged deeply embedded in the skin, cylindrical body with a larger diameter at the height of the first radius of the dorsal fin and a tail with large fin. Colors of this fish family vary and although none is completely black, all have dark shades. 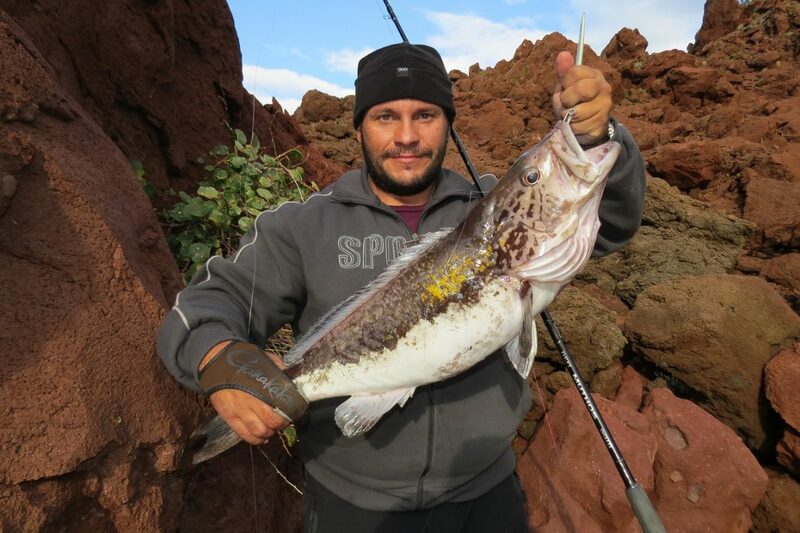 This is the Grouper family with the most common in the Mediterranean the Gold blotch Grouper (Epinephelus costae). 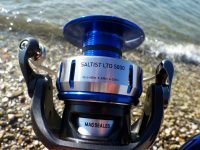 This fish will not make our drags scream for long, and won’t fight more than a couple of seconds, but if we are not prepared, it will go straight to the rocks and the game for us will end there. The Goldblotch Grouper is an agile predator and attacks any living organism that fits in it’s mouth. In contrary with most groupers, Goldblotch Groupers really go hunting. Though closely associated with the hole, temporarily abandons to feed! These groupers love to “crawl” among the rocks looking for unsuspecting fish, cephalopods and crustaceans which with a rapid attack they end at the stomach. Goldblotch groupers do not hesitate even to hunt in groups, together with other predators like Snappers smaller fish like bogue or sardines as high as in midwater and attacking from the bottom. This is why this grouper is the most common that we see on our jig. Because it comes off from the seabed and chase higher, making itself the protagonist of predators of the hole. Although it is a medium sized grouper, still it can reach 5 kilos, one size no inconsiderable. Of course the usual weight of them is 1.5 to 3 kilos and even on those sizes still has great strength and explosion, and easily manages to run in rough spots. Personally so far I have managed to catch dozens of such fish over three kilos and two over 5 where they are for me point stations in my “fishing career”. The hours I love going after them are especially near dusk, but they remain active also during the day. These fish that live near the bottom do not have the speed and reflexes of pelagic that constitute our common catches. This leads us to the conclusion that our jigging style must be different and so our jigs. Generally and as it is easy to understand, we should keep our jig near the bottom with whatever risks this has. The black fish respond much better to long-range hits like 9 to 12 “hour” move on the scales of a watch with a 90o degree move. Also while waiting the jig to sink and when it is close to the bottom, I do not open the pick up reducing more the sinking speed. This will give a more easy target, further avoid contact of the jig with the bottom, avoiding snagging issues. Although most strikes will occur near the seabed, some will occur as high as midwater. This is quite convenient for us, since we have more opportunities to land it. The hit is characterized by an abrupt stop of the jig and after one second follows a strong head way at the bottom. Our brakes should be tight enough to stop the fish. The rod remains in any case upright and trying to put enough stress to the fish and turn its face toward us. Once we achieve this, it may temporarily come calm but certainly will try a second powerful attempt usually at the first rocks it will meet. If it manages to do so, stay calm and loose the line by lowering the rod and wait. The fish is in a random shelter and soon will try to go to its main one. If we attempt to forcibly detach it, we will probably fail and the leader will break once it comes in contact with the rocks. So we wait without exerting any resistance in fish. Waiting varies from a few seconds and sometimes can exceed twenty minutes, but eventually the fish will want to use the safest chamber and will leave junk shelter. This will be our chance because as long as it is with open gills and spikes in the hole, we have no chance. Once it goes, we start pulling and this time it will come to us tired with the belly up. The selection of jigs that meet our needs for those groupers are various, but with no doubt the upper hand have the back-weighted jigs that have the ability to remain in the region of these fish longer. 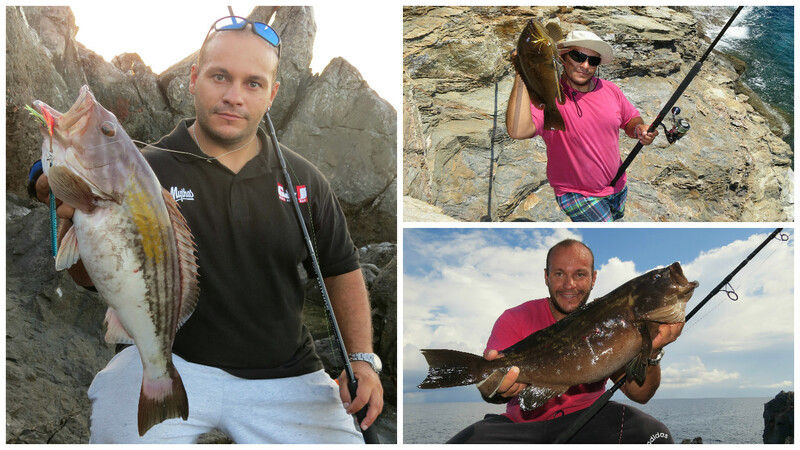 Generally groupers have an issue with the size and attracted by big sized jigs. A big sized jig does not always have to weight much since some are very flat. The colors that Goldblotch Groupers like are sardine collors, pinkish, Gold – greens and nickel. 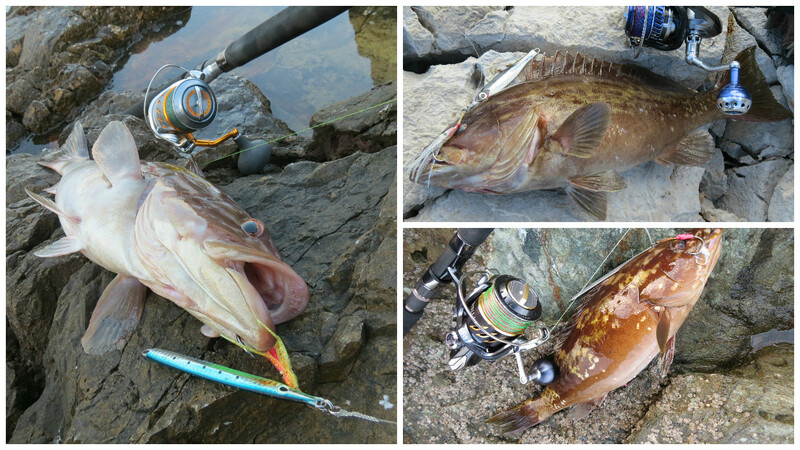 Goldblotch groupers equal stone. The more rugged, rocky and steep is the bottom, the better. So rocky shores with relatively deep waters at least 20m, and very rough sea bottom are the ideal places.